Contacted by ASP Australian, we proudly worked on the rooms and transfers for Gopro ASP World Longboard Championships in Riyuebay, Wanning, Hainan Island. Though it is just for rooms and transfers, but due to the location of the Riyuebay, we had some challenge organizing pick up and transfers services as there are 2 airports on Hainan Island: Haikou is the north and Sanya in the South. We learned that as a surfing competition, we need more flexibility on the cancellation and amendment policy from the hotels to save the cost of the young surfers. The world’s best longboarders will once again hit the sands of China to compete at the prestigious ASP World Longboard Championships. This year’s GoPro World Longboard Championship, China presented by Wanning City Hainan Island will see a combined waiting period for both men’s and women’s events that will run from December 5 – 12 at the left-hand point break Riyue Bay, Hainan Island, China. Hainan Joy Tours & Travel Limited is a travel agency based on Hainan Island with 10 years history in inbound tour services. We have worked with Hainan Surf Club organizing surfing competitions on Riyuebay, and know the area well. 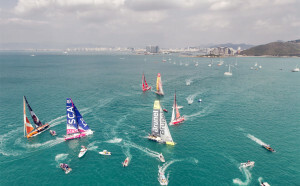 With our successful experiences in sports events in Sanya including Volvo Ocean Race Sanya Stopover 2011-2012, we are delighted to offer the hotel booking and transfer services to all athletes coming to Gopro ASP World Longboard Championships China at Riyuebay Wanning Hainan Island 2014 Dec. 5- 12. For reservations, please email request to iaminsanya@gmail.com with check-in/out dates, hotel name, no. of rooms to book, and no. of persons/room. Located right on Riyuebay Surfing beach, Nanhai Fishing Village (Formerly 21 Century Hotel/Hostel is a local 3-star hotel right on Riyuebay Surfing Beach, renovated in 2014, right on Riyuebay with balcony and free Wi-fi, 24-hour hot water, western toilet, just steps away from the surfing beach. The above rates include local tax, service charge, and breakfast. Please note that no staff in Nanhai Fishing Village (Formerly 21 Century Hotel/Hostel at Riyuebay Surfing Beach speaks English, and breakfast is normally very Chinese. So for any booking or questions, please email Hainan Joy Tours & Travel Service Limited to caddie@sunnysanya.com. The hostel receives tour groups, but most of them arrive late in the afternoon and leave the next morning right after breakfast. So during the day, it is really quiet and empty. Our recommendation would be to stay at the Four Points by Sheraton Shenzhou Peninsula, the level of comfort is a lot higher, the rooms are clean, staff speak English, the quality of the food is good and there are a variety of options to eat (also breakfast is available from 5:30 am each morning). Our past experiences at the 21 Century Hotel are, you get what you pay for.